MEXICO — Families of Mexico's missing are searching for hidden mass graves as escalating cartel violence puts the country on track to see both its highest murder rate and highest rate of disappearances since records began. 28,689 people were killed in Mexico in 2017, according to government statistics. That's the highest number ever recorded, and 2018 is setting a pace to be even more deadly. But at least an additional 36,265 people in this country have simply vanished. Known as desaparecidos, or "the disappeared," some are abducted, others are caught in the crossfires of the cartel-related violence that permeates Mexican society. Many are presumed dead, but without bodies, their families are left without answers. The Colectivo Familias Unidas por Nayarit, or the "Collective of Families United for Nayarit," is a small group based in the western Mexican state of the same name. Every member has lost someone. They meet twice a week to hunt for burial sites. María is one of five people gathered outside the office in the state capital, Tepic, that serves as their meeting point. They have gotten a tip about a possible grave site outside of town. She is looking for the remains of her son, who she saw grabbed off the street and thrown into a white van earlier this year. She said she ran towards him, but by time she got to where he had been standing, it was too late. "They had taken him. He was in a truck a street away," she said. "Like I have my son, others have their children, their siblings, their spouses, their parents. There's every kind of person. That's why we're here; to search." The 2014 mass disappearance of 43 student teachers in Guerrero state caused a surge in search collectives across the country. That case became symbolic of the widespread problem, and on Monday, just two days after taking office, Mexico's new president Andrés Manuel López Obrador announced the creation of a "truth commission" to investigate it. Now, there are more than 60 groups nationally that look for hidden graves, all made up of family members of the missing. "The problem right now is that we have an unusual number of homicides that are connected to organized crime," Juan Carlos Huerta Vázquez, who reports for the Mexican newspaper El Financiero, told CBS News. Jalisco New Generation is based in the state of Jalisco, next door to Nayarit. Jalisco is where Guadalajara, Mexico's second city, is located. "They are not responsible for all the disappearances (in the region), but they are responsible for a good portion of them," Vazquez said. When cartels kill people, they often bury the bodies in hidden graves, or fosas clandestinas. Nearly 2,000 of these graves, usually containing multiple corpses, were discovered across Mexico between 2006 and 2016, according to data released by a project called A Dónde Van los Desaparecidos, or "Where the Missing Go." But authorities in Mexico don't consistently look for them. When they are discovered, in houses, fields, or forests, it is often by neighbors who notice the smell of decomposing bodies, or grassroots search parties like the Colectivo. In and around Guadalajara, dozens of corpses have been found in abandoned buildings in just the last few months, adding to the rising body count. In September, the city's morgue was completely full, so workers put 273 bodies in a refrigerated truck, which was then driven around and parked at various locations. At one point, it was left behind a street of houses in the suburb of Tlajomulco. "(The truck) was bleeding," Terrence Aruglu, who lives in the area, told CBS News. "The door was locked with a padlock, and there was blood running out." Another truck was later found containing the remains of 49 people. Luis Octavio Cotero, the morgue director at the time who was fired in the aftermath of the scandal, said the incident was part of a larger problem. "There kept being more bodies," he said. "What were we going to do?" Vázquez, the Mexican journalist, said the truck reflects "the enormous amount of dead people in the last two years." "Last year was supposed to be the most violent year, but this year has already outdone it," he told CBS News. "No one understands the pain that we're living"
The Colectivo's red pickup truck pulls up beside a sugar cane field, where they have been told a grave may be located. Everyone climbs out. The sugar cane leaves are over six feet tall, densely packed, and sharp, but María pushes her way through them. Bodies, she says, are usually buried a few yards in. She's carrying a T-shaped metal pole. When she finds some ground that appears flattened, she pushes the straight end into the dirt, then pulls it up and smells the soil stuck to the tip. If she's found a grave, it will smell like decomposing remains. It's gruesome work, but María says it gives her a sense of purpose and helps her deal with her loss. 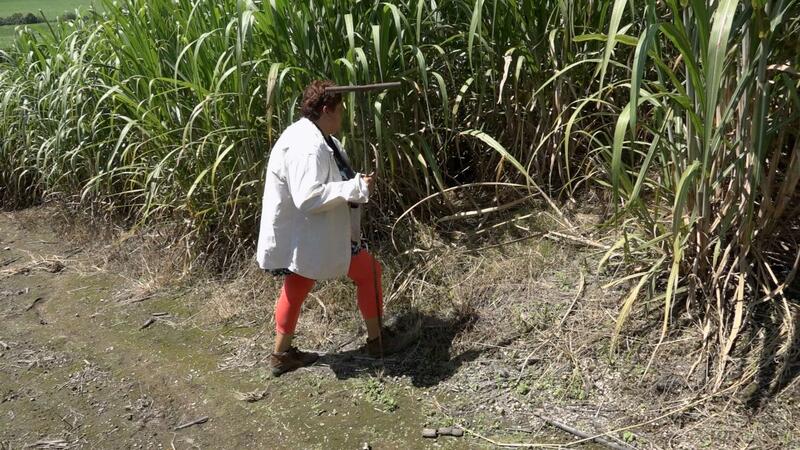 There's no grave in her section of the sugar cane, so María goes and joins the other members of the group, waiting to continue their search in a different part of the field. Everyone is holding metal poles. Once she takes her spot alongside them, together they step forward into the sharp leaves. Alejandra Guillén and Paloma Robles contributed to this report, which was supported by the International Women's Media Foundation.